Tourists flood DC each year to see the blossoms. People are taking to the streets of the nation's capital today to celebrate spring and cherry blossoms at the annual Cherry Blossom Festival Parade. The festival, held every April, thrills tourists and Washington, D.C., residents alike with colorful floats, marching bands, beauty queens, celebrity performers, giant balloons and more. The festivities, which span four weeks, began on March 15, and will continue through April 16. 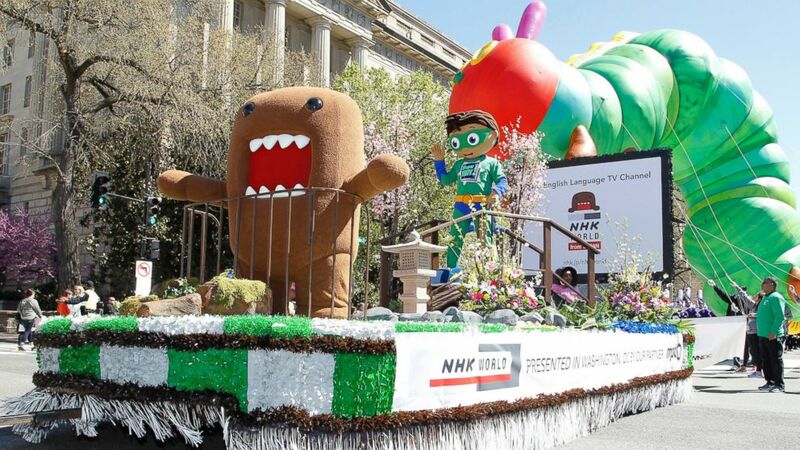 (Paul Morigi/AP Images) NHK WORLD TV's mascot Domo, left, and PBS Kids animated TV series character, Super Why!, right, on NHK WORLD TV's float during The National Cherry Blossom Festival Parade, April 8, 2017 in Washington. 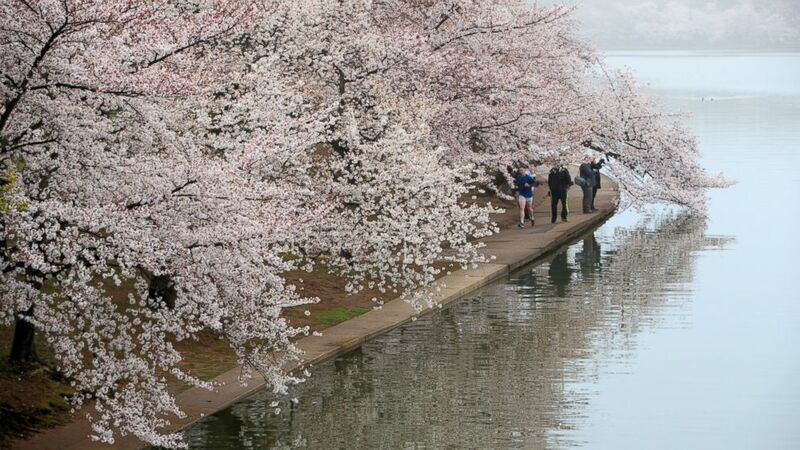 More than 1.5 million travel to DC to see the cherry blossoms, according to festival organizers. 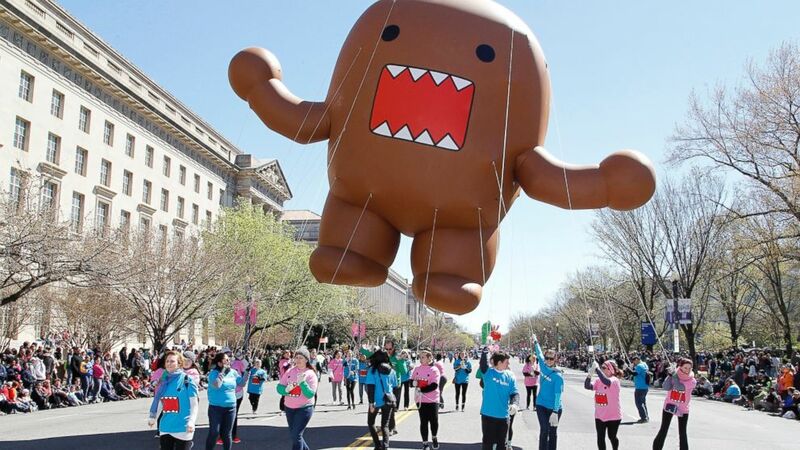 (Paul Morigi/AP Images) NHK WORLD TV's mascot Domo in balloon form during The National Cherry Blossom Festival Parade, April 8, 2017 in Washington. The celebrations honor the friendship between the United States and Japan. In 1912, Yukio Ozaki, the mayor of Tokyo, gave 3,000 cherry blossom trees to the district of Columbia as a gift. (J. Scott Applewhite/AP Photo) Early morning fog mutes the color of cherry blossoms on Washington's famous cherry trees surrounding the Tidal Basin near the Jefferson Memorial, March 27, 2017. Today's festivities will continue until 6 p.m. at the Capitol Riverfront for the Sakura Matsuri Japanese Street Festival. 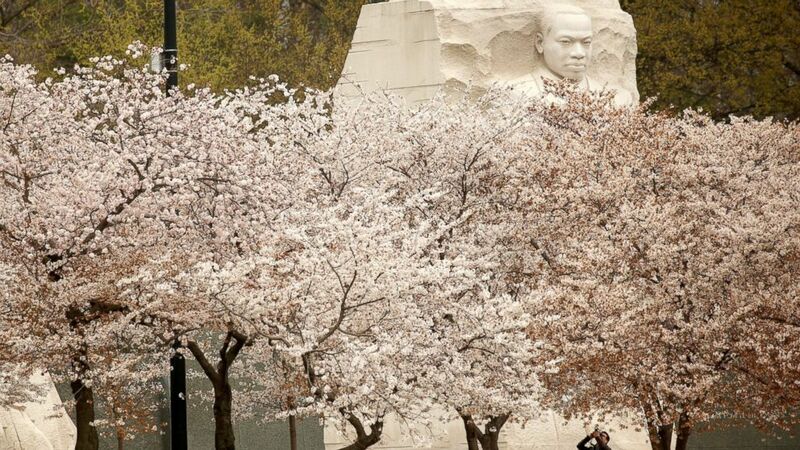 (Kevin Lamarque/Reuters) The face on the Martin Luther King Jr. Memorial rises above the cherry trees as a visitor photographs the blossoms along the Tidal Basin in Washington, March 27, 2017. The cherry blossoms were in "peak bloom" from April 3-6, according to the National Cherry Blossom Festival Organization, and will be changing from light pink to green in the next few days. 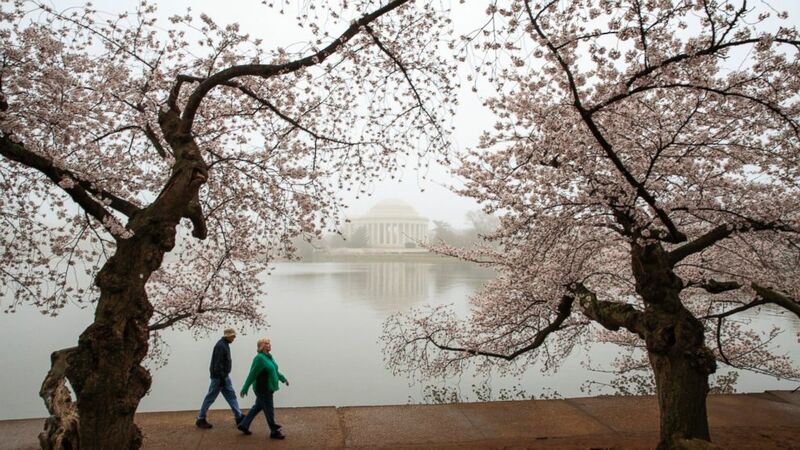 (J. Scott Applewhite/AP Photo) People walk along the Tidal Basin as fog mutes the color of cherry blossoms on Washington's famous cherry trees, March 27, 2017.